Hosted by the ILO in Geneva, the workshop on the Convention No. 169 concerning Indigenous and Tribal Peoples successfully took place on the 18th September 2018. 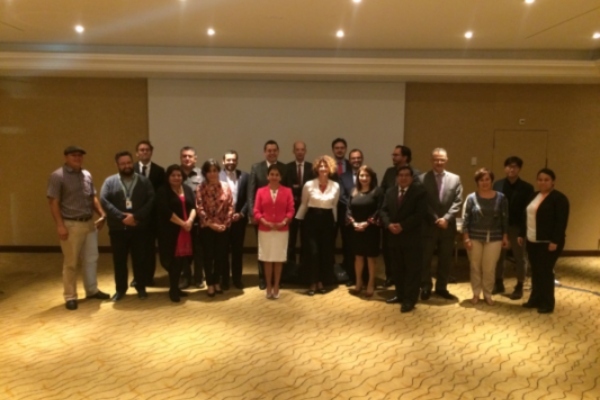 The workshop gathered high-level government officials and workers’ and employers’ representatives from Chile, Guatemala, Honduras, and Peru, along with international experts to discuss the process, challenges, and lessons learned from implementing Convention No. 169. The Indigenous and Tribal Peoples Convention, 1989 (No. 169) is the only legally binding international instruments specifically addressing the rights of indigenous peoples. The Convention has been ratified by 15 ILO member States in the Latin American region and plays a highly important role in these countries. Convention No. 169 is an instrument that not only enjoys wide political support and visibility among ILO constituents and indigenous peoples in the region, but it has influenced constitutions, laws, policies, and programmes regarding indigenous peoples over the last thirty years. The Convention provides a coherent and integrated framework for strengthening democracy and human rights, furthering relations between indigenous peoples and the states in which they live, and pursuing sustainable and inclusive development. ILO’s project: Building capacity of state institutions to implement Convention No. 169 through South-South and triangular experience-sharing targets government officials from Argentina, Bolivia, Brazil, Chile, Colombia, Costa Rica, Ecuador, Guatemala, Honduras, Mexico, Nicaragua, Paraguay, Peru and Venezuela (i.e. countries have ratified the Convention). Against this backdrop, an experience sharing workshop was held on 18th September 2018 in Geneva, gathering government officials responsible for indigenous peoples’ affairs, along with representatives from employer and worker’s organization, and international experts to exchange on experiences, issues, and challenges related to the application and implementation of Convention No. 169 in the Latin American region. The meeting comprised of three sessions: (1) National institutions, prior consultation, and participation, (2) Indigenous women, gender equality, and economic empowerment. (3) Dialogues, alliances, and cooperation. Participants underlined the importance of the Convention as an instrument for good governance, rights and tackling high-level of poverty affecting indigenous communities in the region. They recognized the key role of documenting and sharing practices and experiences across countries and the common search for new and innovative approaches for building effective responses to the many challenges that exist in the Convention’s application. Capacity building for states institutions at all levels in understanding and applying the Convention was considered as critical. Given that countries in the region are at different stages in implementing the Convention, South-South and Triangular Cooperation (SSTC) was seen as an impactful framework for peer-to-peer learning, with the ILO providing facilitation and technical inputs. This pilot project and event – are supported by the South-South and Triangular Cooperation (SSTC) Facility of the ILO’s Partnership and Field Support Department. It is part of a broader portfolio of interventions under the ILO strategy for action concerning indigenous and tribal peoples.